Sony Professional Solutions MEA was awarded the Technology/Service Innovation of the Year for the PXW-FS7 4K XDCAM camera, at the eleventh edition of the Digital Studio Middle East Awards 2015. Vivian Saldanha, Business Head, Content Creation Sales and Market Development, and Romit Shah, Marketing Manager, Sony Professional Solutions MEA, accepted the award on behalf of the company. 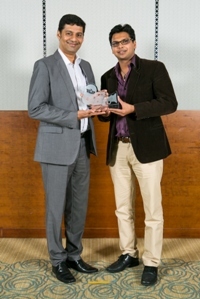 We are extremely honoured to have received the Technology/Service Innovation of the Year award, and would like to dedicate it to our team in Japan who were involved in the development of this product, said Vivian Saldanha, Business Head, Content Creation Sales and Market Development, Sony Professional Solutions MEA. Chosen from a highly competitive shortlist, the PXW-FS7 won the award for being the first 4K XDCAM camera to feature a Super35 CMOS sensor capable of shooting in 4K Quad Full HD (QFHD) and super slow-motion Full HD. Additionally, the Super35 Exmor CMOS sensor within the PXW-FS7 delivers stunning sensitivity, shallow depth of field, a high signal-to-noise ratio and fantastic low light performance. Sony Europe Limited are taking part in the Innovation Trail at IFSEC, June 16-18 ExCeL London. Register now to join them there.